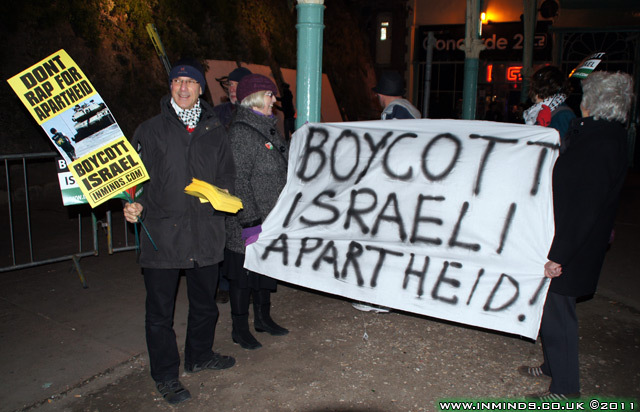 On 29th October 2011 the British band Yardbirds were booked to perform at the Barby in Tel Aviv, in apartheid Israel, following a campaign by their fans urging them to respect the cultural boycott of Israel they cancelled their concert . Days later, on 5th November the Moldavian punkers Zdob si Zdub were scheduled to play at the same Tel Aviv venue, the Barby. 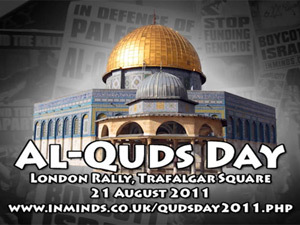 Again following a vigorous campaign asking them to boycott Israel, the concert was cancelled . 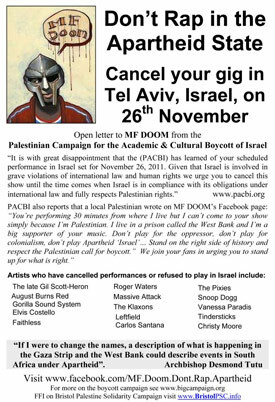 Now MF Doom is scheduled to perform in Israel on November 26 and we are campaigning to persuade MF Doom, a rap artist of African descent, to boycott apartheid. MF Doom's facebook page has already become a battleground. His fans, despite being banned and posts being deleted, swamping the page with requests he side with the oppressed and respect their struggle against apartheid and not cross the picket line they have set. 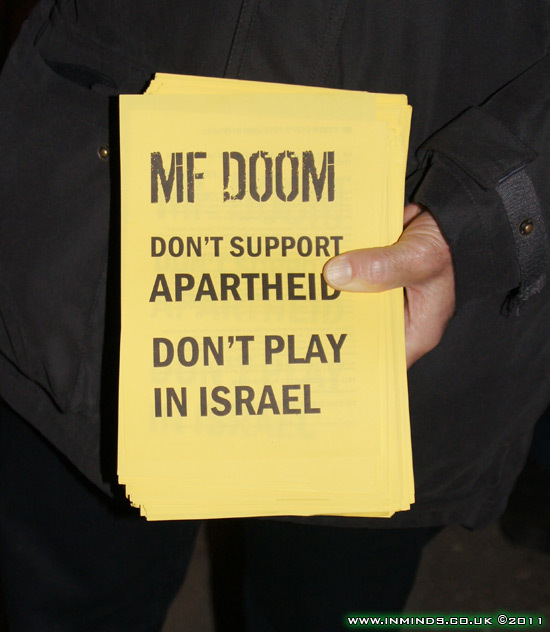 Every performance of MF Dooms's current tour of the UK has seen pickets - 3rd Nov Glasgow, 5th Nov London, 7th Nov Leeds, 10th Nov Oxford, 15th Nov Bristol, and now 18th Nov Brighton. 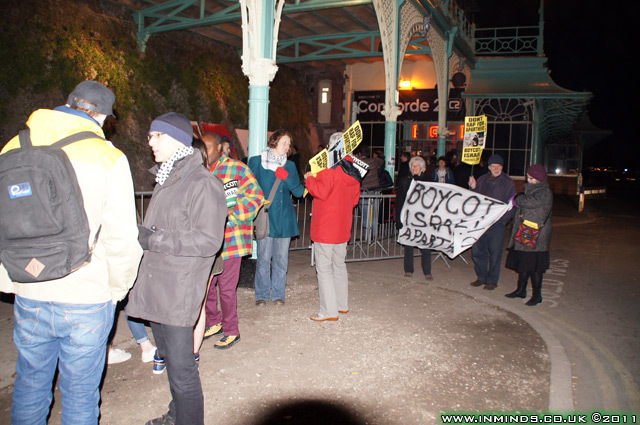 On 18th November MF Doom performed at the Concord 2 in Brighton, this is an account of the picket that greeted him. 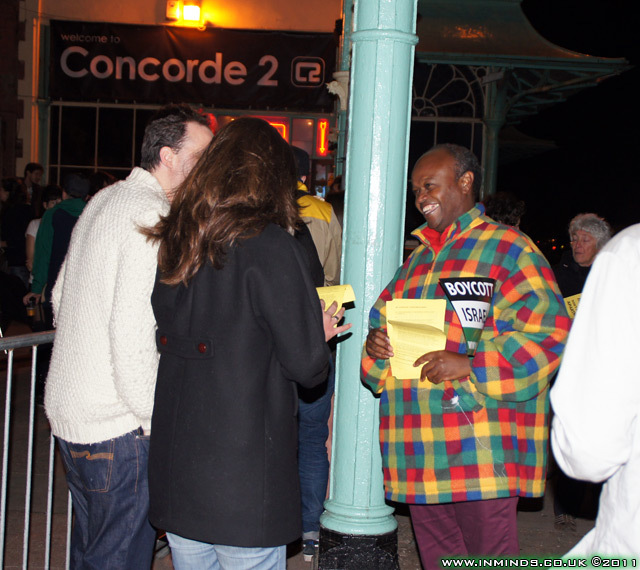 The Concorde 2 club is located on the Brighton seafront. The building, originally a Victorian tea room, faces the beach on one side and is embedded into the cliff on the other. 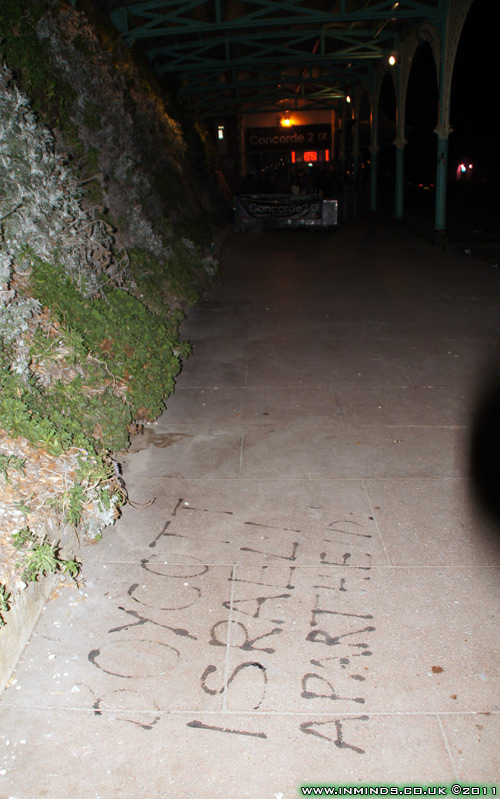 Around a dozen activists arrived early and were in place before the night club opened. 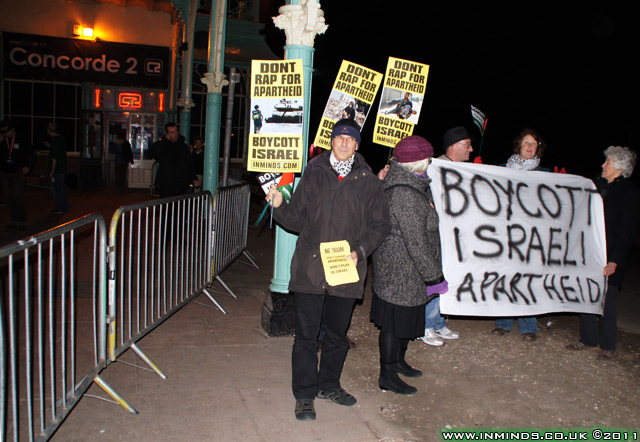 The picket was organised by the Brighton and Hove Palestine Solidarity Campaign. Talking to the club manager revealed that the club had already been warned by MF Doom's team to expect a demonstration. 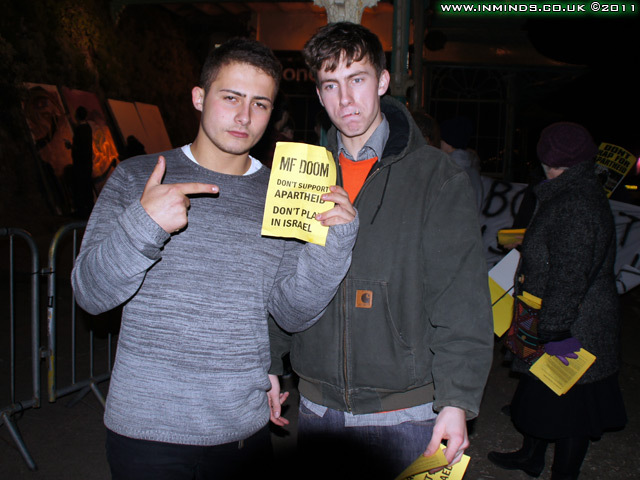 We explained why we were there, we were not demonstrating against his club and had nothing against MF Doom apart from his decision to entertain apartheid. We talked about the parallels between an artist touring Tel Aviv today and touring Sun City during apartheid South Africa and the manager seemed understanding and took one of our leaflets. As the fans started arriving it gave us a great opportunity to engage with them about the issues. 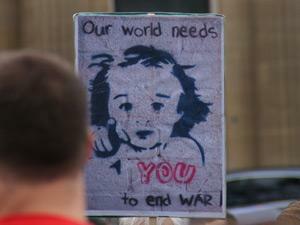 To our pleasant surprise most were already glued up about Palestine and all were very sympathetic to the plight of the Palestinians. 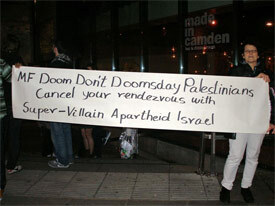 They however were shocked to learn that MF Doom was going to be playing in Tel Aviv. For one ardent fan this revelation was overwhelming, he said he "was embarrassed" that he had bought a ticket to watch a performer who would support apartheid and now didn't feel like going in. One fan did question whether it was right to boycott Israel when there "musts be some Israeli Jews who oppose the apartheid system", we explained that there are Israelis who support the Palestinian call for Boycott, Divestment and Sanctions (BDS) one prominent group, Boycott From Within just a couple of days ago (16th Nov) held a demonstration in Tel Aviv against Hollywood actors who had broken the boycott call, their banners read "No Culture in Whitewashing Apartheid, Shame On You Hollywood". 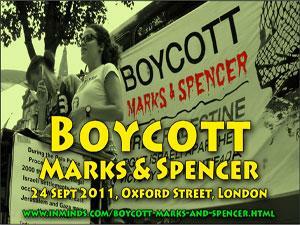 We are a group of Israeli citizens who support the Palestinian call for boycott, divestment and sanctions (BDS). 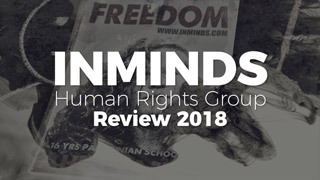 We oppose our government's policies of racism, apartheid and occupation, and we strongly believe that without international pressure, it will be almost impossible to reverse these policies..
You have an opportunity to stand with the oppressed. 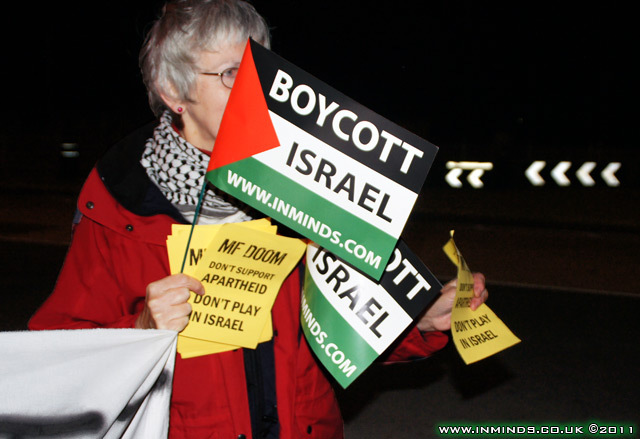 Please don’t play in apartheid Israel, until it complies with international law, ends its brutal occupation, recognizes full equality for its Palestinian citizens and respects and protects the Palestinian refugee’s right of return to their homes and properties. 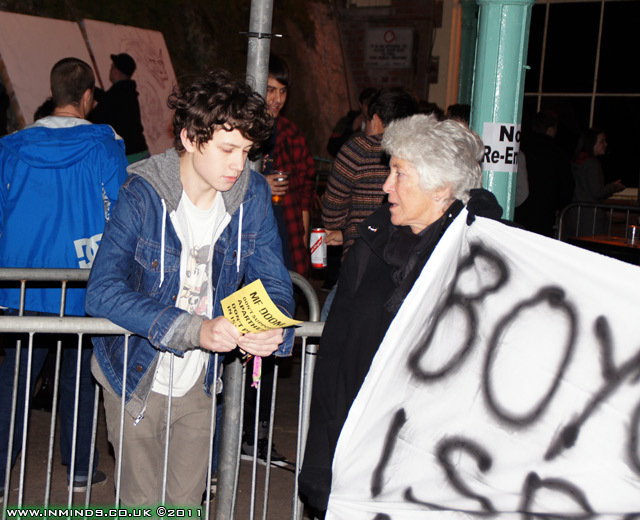 Brighton and Hove Palestine Solidarity had printed hundreds of leaflets for the occasion. 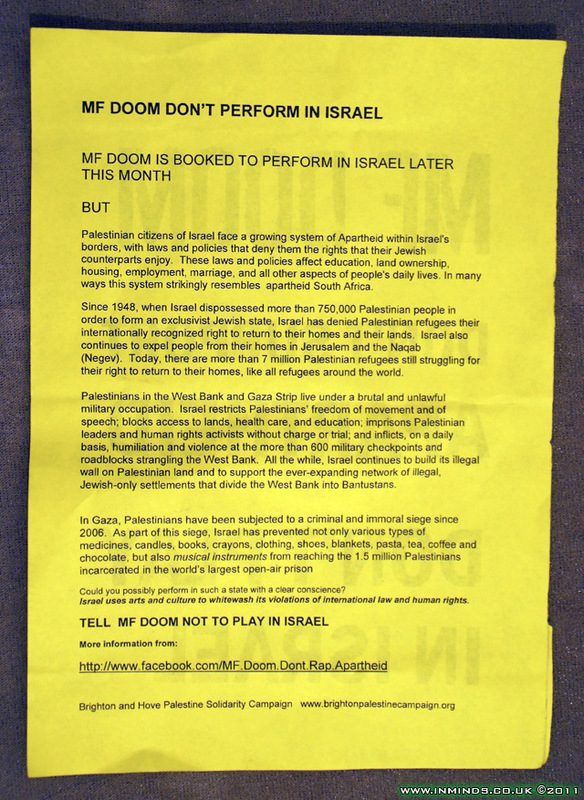 In large text one side read "MF DOOM Don't Support Apartheid, Dont't Play in Israel" with the other side giving details of the plight of the Palestinians. 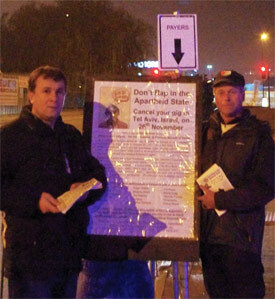 Without exception every fan took a leaflet, as did many of the staff and passers by. Our understanding is that Brighton was the last stop in Mf Doom's UK tour. 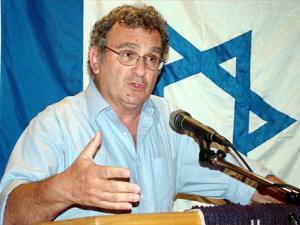 In a weeks time he is scheduled to perform for apartheid Israel. 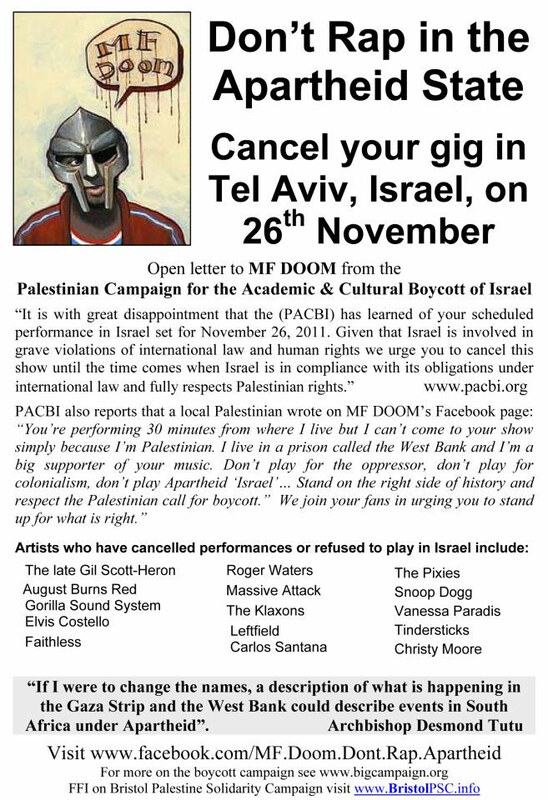 We as activists, through our protests, have tried to be the voice of the oppressed Palestinians and conveyed their message to MF Doom. His fans, through facebook, have conveyed their message of hurt and betrayal, if he decides to ignore the oppressed Palestinians. The decision is now with you Mf Doom. Remember every decision has consequences. Be on the right side of history and hold your head up high as one who rejected the lure of apartheid money and sided with the oppressed. Below is the original message to you from Palestine, read it again if you are still undecided. 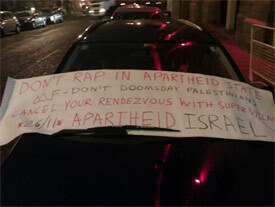 Open Letter to MF Doom: Don't entertain a doomed apartheid regime! 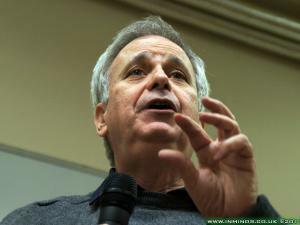 It is with great disappointment that the Palestinian Campaign for the Academic and Cultural Boycott of Israel (PACBI) has learned of your scheduled performance in Israel set for November 26, 2011. 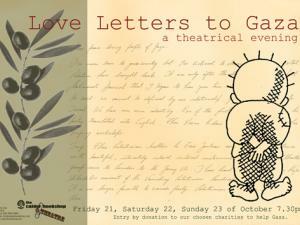 Given that Israel is involved in grave violations of international law and human rights we urge you to cancel this show until the time comes when Israel is in compliance with its obligations under international law and fully respects Palestinian rights. As we will explain below, Israel practices ongoing occupation, colonialism and apartheid over Palestinians. 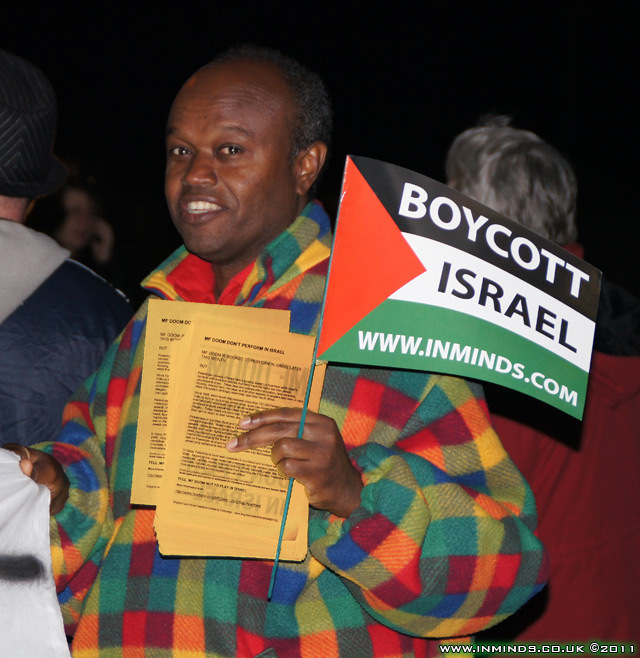 As a prominent artist of African descent, we hope you can relate to the meaning of this racist, multi-tiered system of Israeli oppression, and its devastating impact on our lives and our culture. 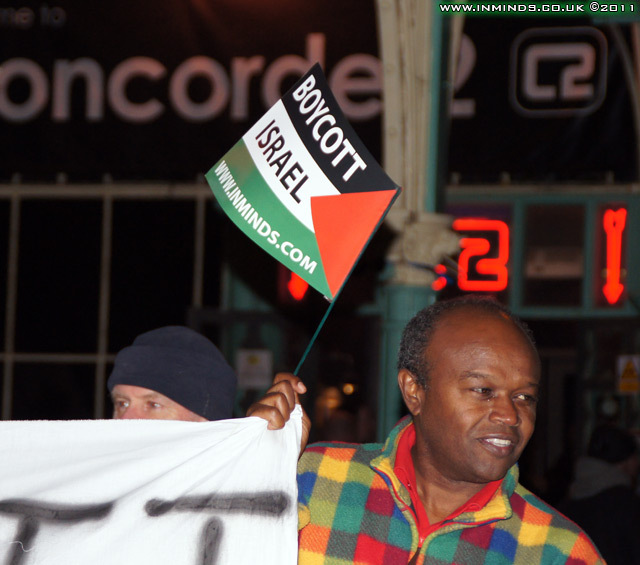 Refusing to entertain Israeli apartheid is a minimal expression of solidarity with our aspirations for freedom, justice and equality. 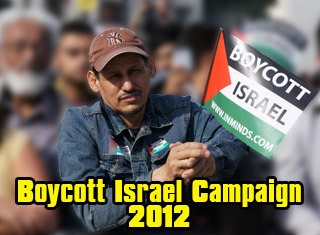 If you play in Israel, you would be performing for the oppressor while undermining our peaceful struggle for justice. 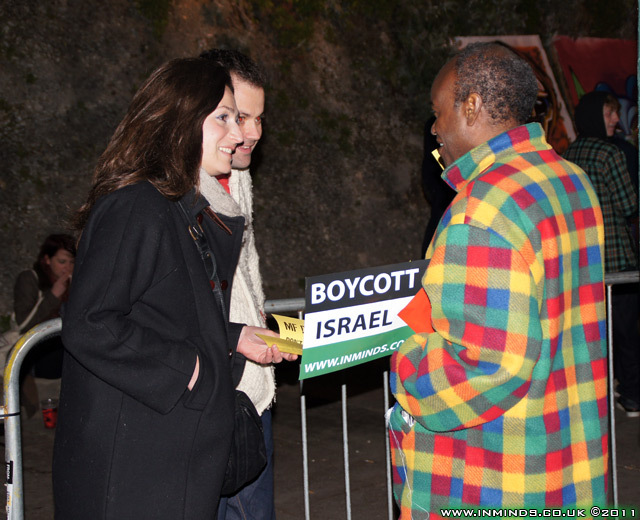 Many of your fans have expressed their outrage over your coming performance in Tel Aviv. In fact, a local Palestinian contemporary of yours, Boikutt Kutt, has written on your Facebook page: “You're performing 30 minutes from where I live but I can't come to your show simply because I'm Palestinian. I live in a prison called the West Bank and I'm a big supporter of your music. 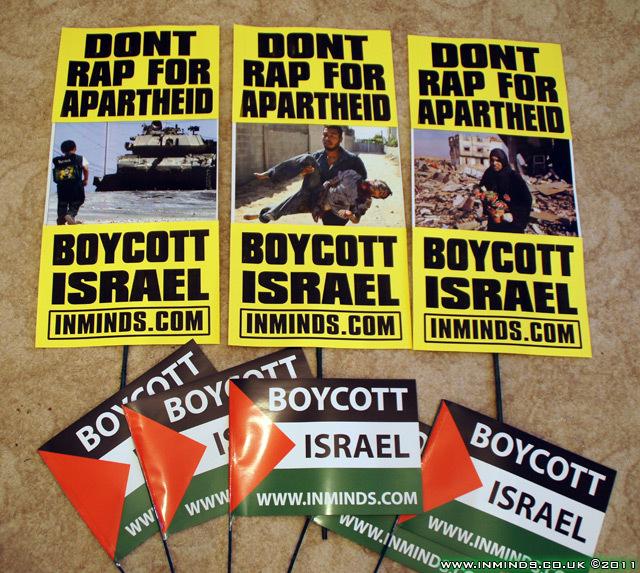 Don't play for the oppressor, don't play for colonialism, don't play Apartheid 'Israel'… Stand on the right side of history and respect the Palestinian call for boycott." We join your fans in urging you to stand up for what is right. Your performance would serve this Israeli campaign to rebrand itself and will be used as a publicity tool by the Israeli government. Hip Hop and rap are political in their true nature, and your own career has shown how this form is a means to fight power and injustice. 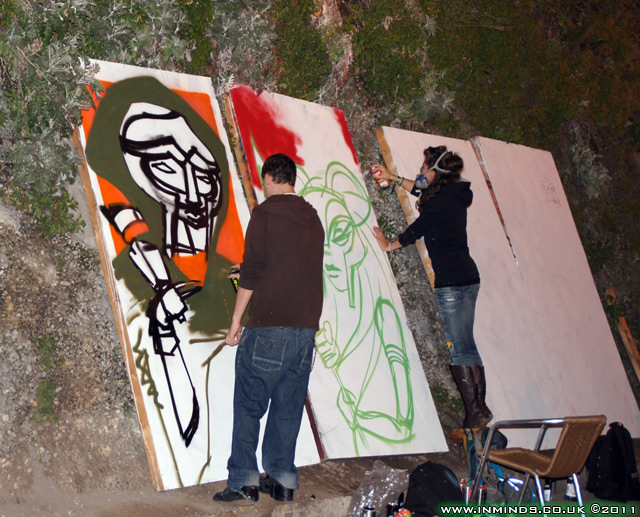 To allow your art to be manipulated by colonial oppressors would be a grave injustice to this art form and to those whom it claims to represent. Today, Palestinian civil society groups are calling on artists to shun Tel Aviv in the same way that South African activists called on artists to boycott Sun City. 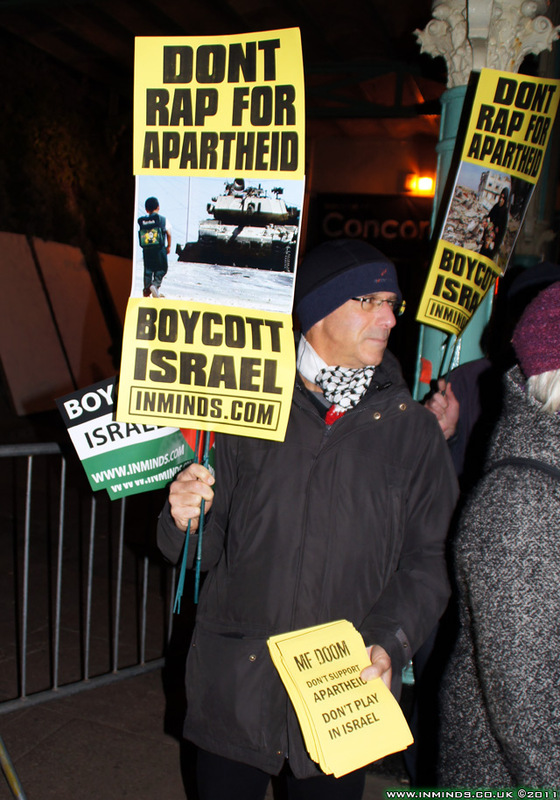 All we are asking is for you to refrain from crossing a picket line called by Palestinian society, endorsed by international organizations, and increasingly supported by progressive-Israelis . Palestinian civil society is asking this of you as the most essential contribution to their struggle to achieve peace and justice. 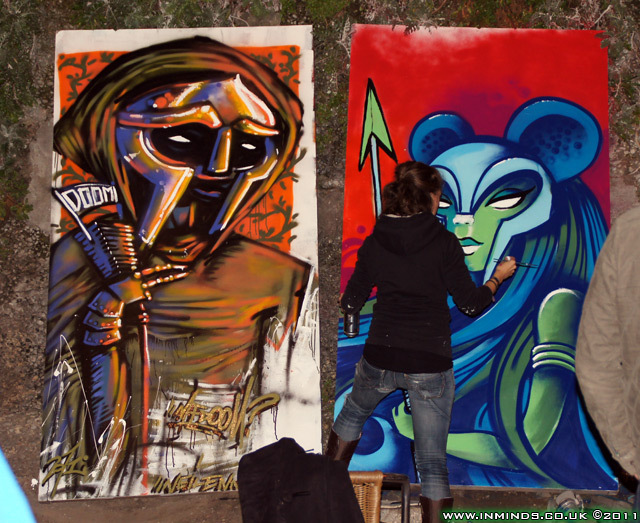 Great artwork, but wouldn't MF Doom look better holding a Palestinian flag? 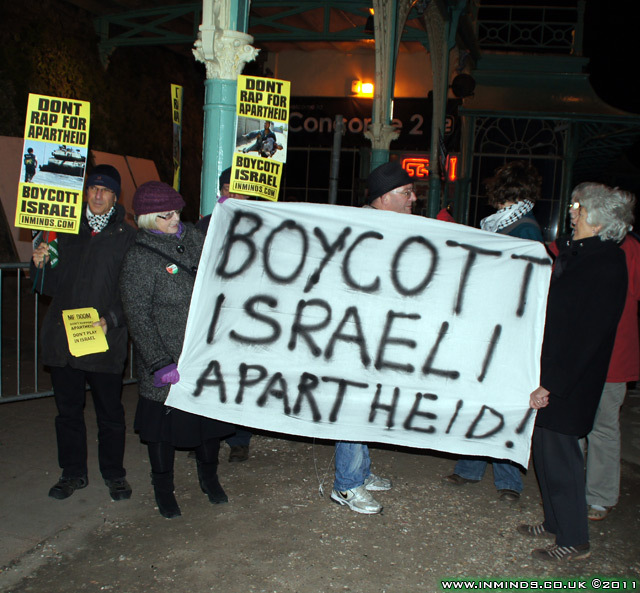 Activists in Brighton set up a 'Palestine Solidarity Settlement' in Waitrose supermarket to protest against the demolition of 23 Palestinian homes in Al Farisiya by the Israeli Army the day before on 19th July.